Radical proves that dynamite comes in small packages. David Platt’s little book is but 240 pages but packs a wallop when it comes to living the Christian life. I don’t recall how it was I came across Radical but it was a breath of fresh air. There is no complicated theology to wade through. You don’t need two degrees and a dictionary to grasp his simple message. Platt challenges his reader to break away from our self-centered materialistic culture and reach for true happiness in Jesus Christ. This volume challenges our complacent lives. Platt believes we are complacent about the gospel and all too comfortable in our materialistic world. It’s past time to move Jesus Christ to the top of our priority list. 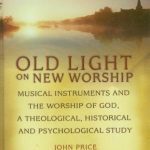 Platt relates stories of successful men and women who have radically changed their lives to devote more time and money to the pursuit of evangelism and benevolence. It’s hard to read this book and not blush a bit at the wealth we enjoy versus the poverty most of the world lives in. 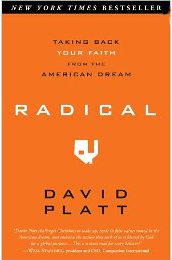 Now Platt is not arguing for some kind of government intervention in economics and he is not political at all but he does throw down the gauntlet to challenge us to live lives more in line with our Redeemer. There is one striking example early in the book that grabbed my attention. A newspaper writes about a large church in a major city that spent $23 million dollars to build a new facility. On the same page was a story about the same group that sent $5,000 to help refugees in the Sudan. The contrast between the $23 million and $5,000 was just to great to ignore. “Twenty three million dollars for an elaborate sanctuary and five thousand dollars for hundreds of thousands of starving men, women and children, most of whom were dying apart from faith in Christ. Radical calls upon the reader to be a better steward of his blessings. Use what you have to help others and always look toward the redemption of souls. In a flash of frustration Platt addresses through who decline to be involved in foreign missions because they say they have a desire for their own community. That may be ok if they are really evangelizing their neighborhoods, but most, he concludes, do not. Personally, this book beat me up. 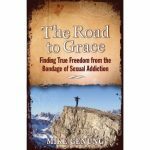 I would read a chapter or two and have to stop because I had been convicted. I was convicted because I whine about my bills, I bellyache about my problems when most of the world is headed to hell. I need to do more and I will. I suspect you will be challenged too. At around $14 this is a fine book for your consideration. But be warned: It is explosive! You make some excellent points. I didn’t know he preached his book every week. I think Platt makes some very valid points but it is all part of a larger role of our submission to God.